Adequate hearing is essential to maintain a connection with the outside world. In general terms there are 2 main components to our hearing, the conductive component and the sensori-neural (nerve) component. Both of these components can be affected by inherited and acquired conditions. This can range from simple mechanical problems such as wax impaction in the ear canal and fluid behind the ear drum, to molecular changes affecting cochlear hair cells and tumours compressing the nerve of hearing. Any degree of hearing loss requires careful measurement and assessment. As there is a wide range of possible pathologies there is a wide range of treatments that may be required. Presbycusis (age related hearing loss) is the most common form of hearing loss. It is the predominant neurodegenerative disease of ageing. It is generally slowly progressive, symmetric and irreversible, and in some has a genetic predisposition. It classically affects the higher frequencies and in early cases causes hearing difficulties especially in the presence of background noise. Noise induced hearing loss is the commonest preventable form of sensorineural hearing loss. Prolonged exposure to noise creates damage to cochlear hair cells, microscopic components of the inner ear that are responsible for converting sound waves into an electric neural signal that is perceived as sound. When exposed to loud noise the ear can react by creating a sensation of tinnitus or ringing in the ear. Initially this is self resolving and is termed a temporary threshold shift. Repeated and extended exposure to loud noise can then lead to permanent damage. As a general guideline permanent damage can occur after exposure to noise at 85dB after 8 hours. For every 3dB rise in noise input, the ear can last half that time. So at 88dB, 4 hours is the maximum exposure. 91dB 2 hours, 94dB 1 hour, 97dB 30 minutes, 100dB 15minutes and so on. As a guide to the level of environmental noise, a chainsaw runs at 100dB. The level of noise within a nightclub however also runs around the 100dB level. Single sided nerve deafness. This is often following a severe infection, trauma, or the removal of a tumour of the hearing nerve. The principle relies on transfering the sound from the bad ear to the good ear creating the illusion of hearing again from both ears. Other options here include a BiCross hearing aid or a cochlear implant. Importantly it is essential to run a trial of the BAHA, prior to proceeding to surgery. This is performed by using a soft headband to hold the hearing aid in position. Whilst not giving as efficient a result as the final result it does provide a good idea as to the expected benefits. A number of recent developments have significantly improved the results of bone anchored hearing aids. This includes the implantable devices as well as the external processors. Lower profile, magnetic options and wireless integration are all upgraded features. The cochlear BAHA 5 system allows a wide fitting range with connection options and processor options. The 3 processors are the BAHA 5 (up to 45dB), BAHA 5 Power (up to 55dB) , and the BAHA 5 Super power (up to 65dB). This allows a much wider fitting range for appropriate patients. The processor can then be attached either via a transcutaneous magnet, or an abutment. 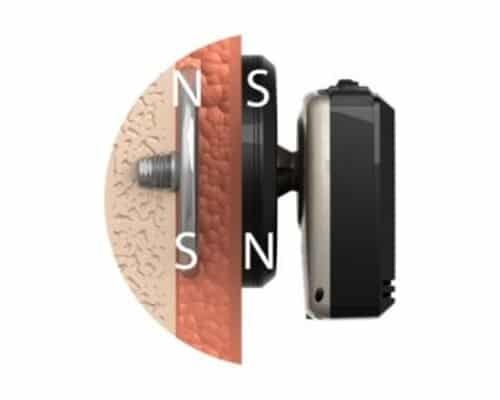 The obvious advantage of a magnetic attachment is the lack of an abutment that passes through the skin that has a small risk of causing skin irritation. The advantage of the abutment is that it provides the most efficient transfer of sound. BAHA attract, which allows the placement of a subcutaneous magnet, that avoids the need for a trans-cutaneous abutment. For further information: Cochlear BAHA. Image above shows the internal component and external processor. This implant is placed completely subcutaneously, requiring approximately 4mm of bone to secure the implant. 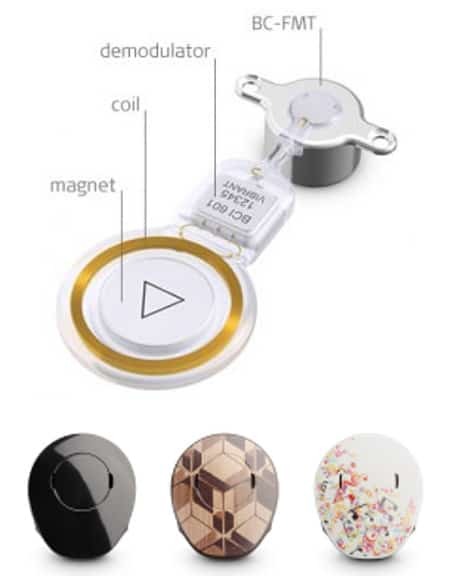 Once implanted the internal device connects to the external component magnetically in the same way that a cochlear implant does. The external processor, the Samba, is very low profile and this also minimises feedback. The other feature of this device is that it is an active implant. This means that the microphones of the external device picks up a sound wave and converts this into an electrical signal. This is transferred to the internal component which then converts this into a vibration. The limit of sensorineural hearing loss is 45-50dB. 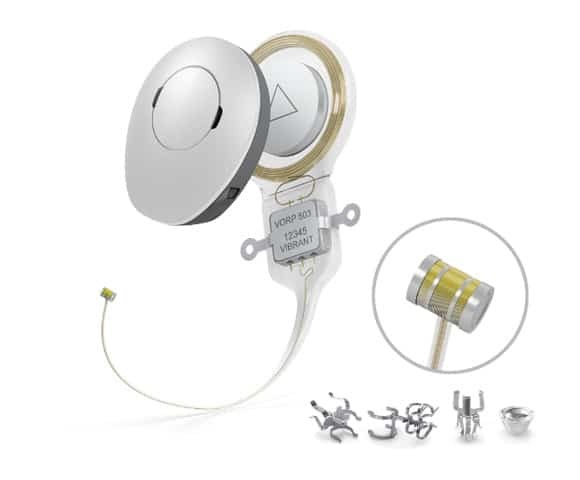 The Vibrant soundbridge is a middle ear implant system that is a great option for hearing rehabilitation in patients with a significant conductive hearing loss not amenable to standard hearing aids. The audiologic advantage over a BAHA or a Bonebridge is that the unilateral cochlear is stimulated maximising the advantages of directionality. The active part of the implant is connected to residual ossicles or even to the round window. For further information: Vibrant Soundbridge. Please do not hesitate to contact us if you have any questions or would like to make an appointment. If you are a candidate we will discuss in more details and arrange a trial as appropriate.